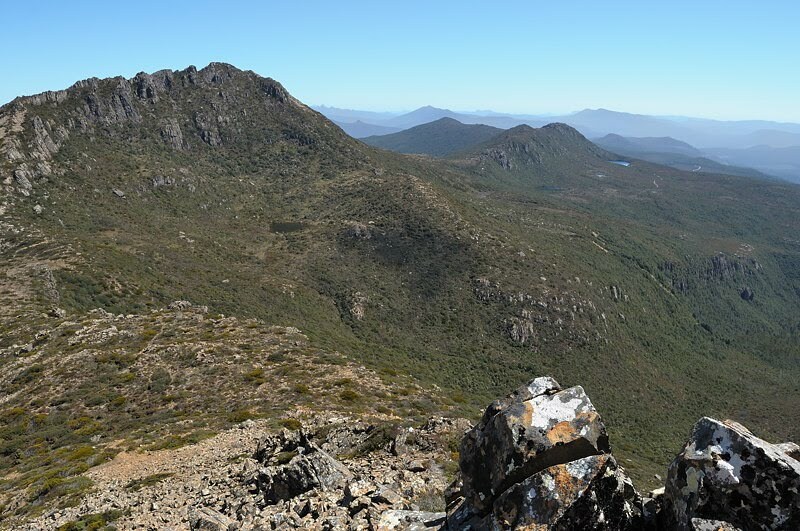 This walk connects Hartz Peak and Mount Snowy south of the main peak, with some off-track and route walking. It provides great views while traversing along the ridge. 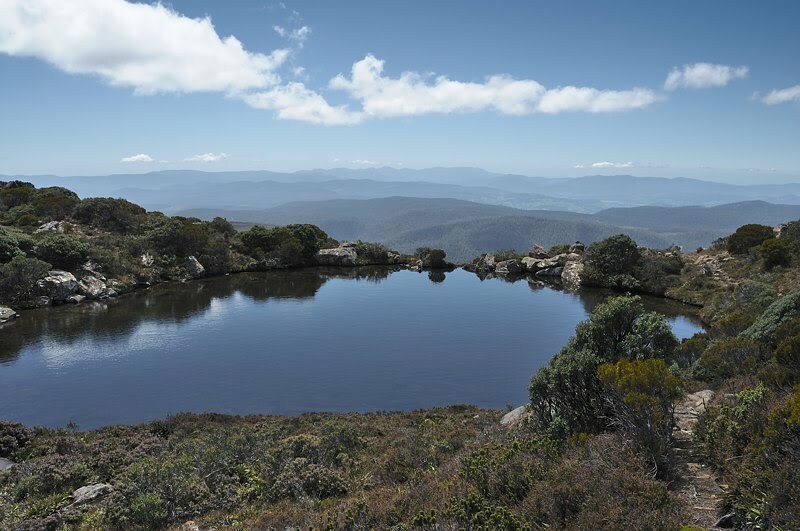 Emily and Arthur Tarns are features of the return walk. 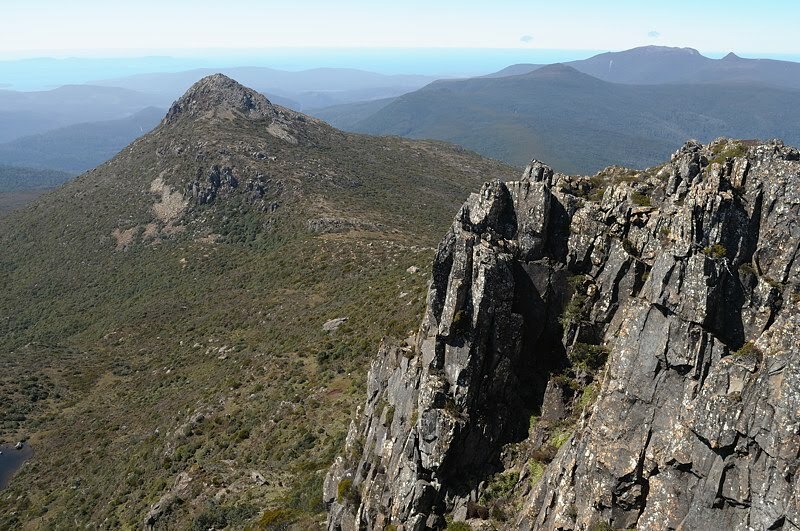 The walk starts with a standard ascent of Hartz Peak. It is advisable to carry extra water, as you are unlikely to find any until descending to Emily Tarn after the ascent of Mount Snowy. The route then heads along the ridge to the south. The first part of the ridge consists of buttresses, and you need to descend to the right/west to boulder-hop around their lower ends. If tempted to climb back to the ridgeline, you'll get a good view and there are some good cliffs to look down, but you need to get past a good few buttresses before the ridge-top is easily navigated. There is no need to do any rockclimbing or even actual scrambling at any point going in either direction. If you find that you need to, you've missed the easiest way and can either proceed if comfortable, or go back a bit and find an easier way. Eventually the ridge starts to drop steeply towards the Hartz/Snowy saddle. There is a little scrub here and you may have to wade through some scoparia, but it's pretty easy to tell where you're going. Descend to the saddle. Note that from this point you can walk along the south ridge to Adamsons Peak. I gather it's a bit dry and scrubby, and it would be best to get some directions from someone who knows the best way. From the saddle there is a cairned route up Mount Snowy. It's occasionally indistinct, but basically head for the big scree patch and there are cairns up the middle of it. You'll know when you're at the top - it's the highest bit.... Good views of Hartz Peak from here, as well as the ranges to the south. Descend again to the saddle. From the saddle there's a cairned route which drops off to the right/north and heads for Emily Tarn. This passes through alpine shrubberies which can be a little moist underfoot at times. The way is also occasionally indistinct. In clear weather you can see Emily Tarn though. (Maybe when it's foggy, people who haven't done this walk before might be advised to leave it for another day actually.) 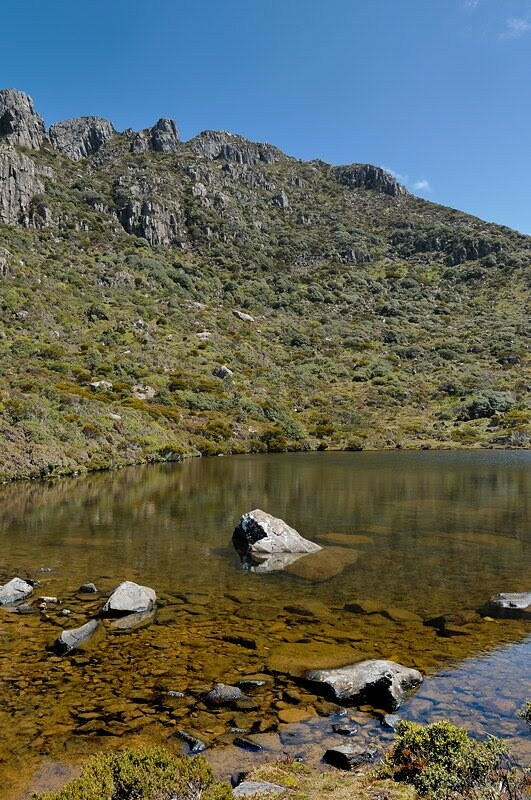 Emily Tarn is lovely, with the cliffs and crags of Hartz Peak ringed above it, and with a great view of Mount Snowy. There are good spots to put up a tent here, but please don't take lots of people there, it's pretty fragile. Oh, and there aren't LOTS of tent sites, certainly not together. 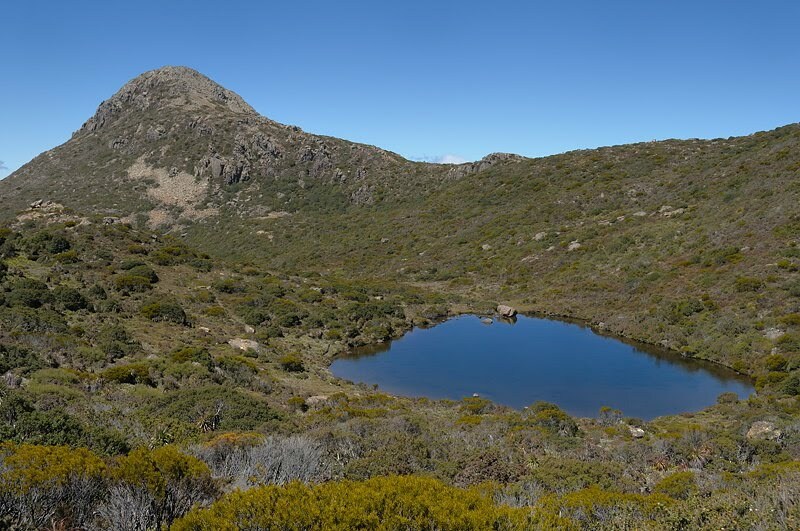 The return track continues around the right of the tarn and then climbs to a cushion-plant lawn in a tiny saddle between Emily and Arthur Tarns. This bit is definitely moist underfoot, and is becoming a little degraded. The track descends slightly to Arthur Tarn which sits perched above a steep drop and can be very visually attractive. Below Arthur Tarn the track drops down the outlet creek, and winds down a little before entering the creek bed which it follows for a couple of hundred metres. You need some navigational smarts below here, keeping a lookout for cairns and tags. The track then undulates across the plateau to return to Ladies Tarn. As a useful guide in clag, it would be a good idea to have marked Ladies Tarn in your GPS to give you something to aim at. The track has some apparent false leads in a couple of places. If the track peters out, backtrack a little and cast about for another route. This plateau walk can be wet to very wet underfoot, and will boots will probably be most comfortable. The track emerges just above Ladies Tarn, and you turn right to retrace the walk to its beginning.